The 13th Conference of Kolkata Nagarik Samelan notes with serious concern the growing attempts to raise communal passions in the country for political gains. The recent ethnic conflict in Western Assam is being utilized to fan communal hatred across the country posing threat to the social fabric of India and our National Unity. The rumour and hate messages using the social media has created the scare among the workers and students of North East rigion in the metropolitian cities of India. This has serious consequences for the unity and integrity of the country. There are also efforts by chauvinistic forces in Mumbai to create a divide between the Dalits and Muslims. This will have serious impact on the unity of the working class which is engaged in fighting the neo-liberal economic policies. The cultural policing has become the common and regular features of life in the State. The recent incident at Mangalore exposes the political patronage the culprits enjoy. The Muslim and Christians are living in constant fear. The fear of safety and security is being utilized by militant organisations within these communities and efforts are being made to wean away the people from the common struggle of the working and toiling people. The government has failed to instill any confidense with the minority community. Muslims are still waiting for justice in Gujrat. The Christians continue to wait for justice in Odisha and Karnataka. On the other hand there are number of instances where youth from the minorities are targeted and harassed by the police on the pretext of combating terrorism. This 13th Conference of KNS calls upon the entire working class and progressive sections of the Indian society to join the struggle to fight the communal forces in order to protect and preserve communal harmony and our national unity. The unprecedented growth of unemployment in the country has acquired the dimension of a serious crisis. The 13th conference of KNS expresses deep concern at the alarming unemployment situation in the country. This high unemployment, which is a result of 20 years of economic reforms posing a serious threat for the future of millions of Indian people. While the ruling classes of our country orchestrate the triumphalism of economic reforms, the recent data has undoubtedly proved that the much proclaimed growth story has failed in generating enough employment opportunities for the masses, especially the youth. The most disturbing factor about unemployment is that the rate was much higher among the youth of 15-29 years category as compared to overall population. The fact revealed by the NSSO data that the youth unemployment among educated persons was higher and it was highest in the category of graduate and above is a matter of grave concern. The government which is the main employer in the organized sector has been pursuing recruitment ban, abolition of posts and outsourcing employment opportunities in the government sector have also came down. Both Central and State Governments are responsible for this situation. A data compiled from answers given in parliament shows that more then a million vacancies are lying unfilled in various Central government departments, with the number of unfilled vacancies in the police and defense forces alone amount to over 7 lakh. Both industry and service sectors have failed to absorb the surplus workforce from agriculture. Governments proposed moves like allowing FDI in retail will further worsen unemployment in the country. This deepening crisis of unemployment will lead to adverse socio-economic consequences. The growing disillusionment and anger of unemployed youth can be utilized by communal forces and other disruptive elements. KNS has to maintain a constant vigil against this danger and must continue to mobilize youth against the policies that propel such high levels of unemployment. In order to arrest this trend of unprecedented growth of unemployment the neo-liberal policies needs to be reversed. Therefore the 13th conference of KNS calls upon the youth of our country to intensify resistance against policies that fuel unemployment. The 13th conference raises the following demands for building a broad movement against unemployment. Both governments have utterly failed to check inflation and spiraling prices of essential commodities. Food prices in India have sky-rocketed over the past few years compare to the general price increases greatly harming the people. Prices of food items like pulses. Vegetables, fruits, edible oils, sugar, milk, eggs, meat and fish have witnessed very steep increases, causing great hardships to the youth of the country who is facing the brunt of such drastic increase in prices of essential commodities while he percentage of unemployed youth in country is also enormously exceeding all the past records. The neo-liberal food policies of the government are responsible for high food inflation. Hoarding of food items, speculative futures trading, faulty export policy and the penetration of big corporate in the food chain combined with stagnant productivity and low growth in agriculture have contributed to spiraling food prices. The 13th Conference of KNS expresses its serious concern at the deteriorating public health system in the country. In our country, even after 65 years of independence the public expenditure on health services continues to languish at around 1.2 percent of the GDP. Over 70 percent of the total health care expenses are bourne by the people themselves. As a result India is one of those country where out of pocket expenses on health care are highest. The vast majority of out people are faced with a challenge of all sorts of health problems. While malarias, hepatitis jaundice, dengue etc. are common occurrence, the number of diabetic, cancer and AIDS patients is increasing and malnutrition and anemia needs no mention. In such a situation the poor people are forced to sell even their homes and land to save their lives. This situation has provided further space for unbridled expansion and loot for the private sector which often provides care of dubious quality at exorbitant rates. With the entry and consolidation of MNCs in the pharma sector, drug prices have also increased sharply. The govt. is reluctant to effectively control the prices of essential medicines. The 13th Conference of KNS demands that the government take urgent steps to ensure a comprehensive and universal healthcare system by the public sector. This conference also demands that expenditure on health care should be increased to 5 percent of the GDP. As youth constitutes the majority of our population, 13th conference urges them to rise unitedly to fight against the deterioration of public health system. 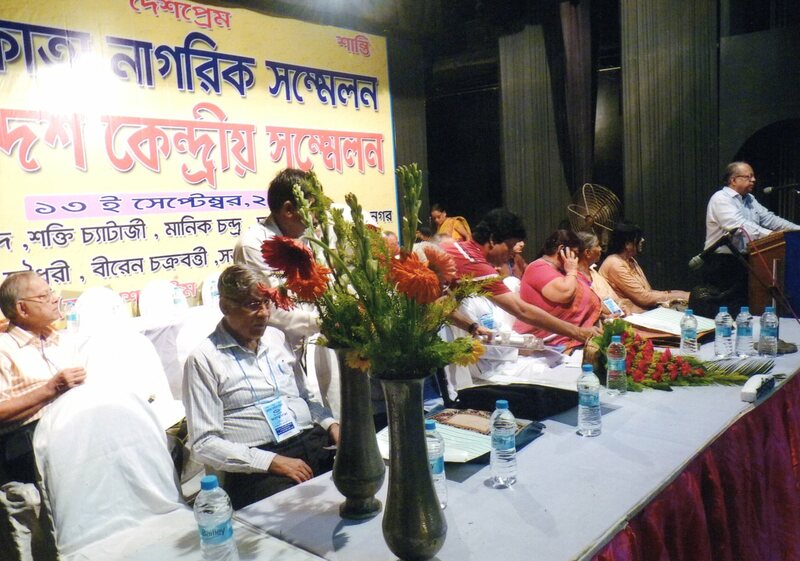 The 13th Conference of Kolkata Nagarik Samelan demands universalization of education, equitable access to education and social justice in education and strongly oppose privatization, commercialization of education and centralization of education and prevalent rampant corruption in education. KNS since its formation has put forwarded the demand for ‘Education for all’. Even after 65 years of independence, universal education is still not available despite the fact that constitution provides for to the Indian State to give free and compulsory education in its directive principles of state policy. In its decision in 1993 The Supreme Court has given right to education a status of fundamental right while treating it as implicit in ‘right to live’ under Article 21, In 2002 education was given a status of fundamental right through a constitutional amendment and added it as article 21(A) in the Constitution and in 2010 Right to Education Act, 2010 was enacted. But, the respective governments prefers to measure the development of the nation by sensex and foreign investment and do not even consider the indicators and status of education, employment and health as measures of development. In 1964 the Kothari Commission after a comprehensive study recommended the government to spend 10% of the central budget on education and to implement “common schooling system” to provide quality education to all. But subsequent governments of our country did not implemented those recommendations till date. Absence of democracy in educational institutions is an important aspect of our times. In many states student union elections are not taking place. In campuses which have a duty to incorporate democratic – political consciousness in students, these students are punished and victimized if they take such initiatives. Our conference demand for democratization of campuses. Apart from that financial anarchy growing in educational institutions, corruption like scams in scholarship etc and unhealthy practices in evaluation needs immediate intervention. Apart from private sector, government is also keen to allow foreign capital in education, foreign universities etc which will not only further privatize and commercialize education but also adversely affect the intellectual sovereignty of our country. This 13th Conference of KNS expresses its deep concern about these issues and demands immediate actions to cope up with the situation. This conference also gives a call for intensifying the struggle against neo-liberal attacks on education.